Imagine having the Bank Holiday Weekend just for yourself, taking time for YOU to relax, reset and revitalise in preparation for the Summer. . .
Join us for this 3-night detox retreat, a life-changing experience to Energise you in a breath-taking natural surrounding. Perhaps you’re simply curious about detox and why it is so important? What it is exactly and how you can add detoxifying foods and techniques to your lifestyle? By choosing to detox in the Spring, we are helping the body get rid of the accumulated damp from the winter months. We are giving support for the body to do its natural detoxification process efficiently, which decreases the likelihood of coming down with a seasonal cold or experiencing hay fever and other allergies. Our retreat has been designed to give you that much deserved time and space to reclaim your vitality. The music, smells and food throughout the whole weekend, will be carefully chosen to enhance your senses. 42 Acres centre will add magic to your experience. We will connect with nature and the elements and together, go on a journey of discovery: releasing what is ready to go and nourishing the New You. You will leave the retreat feeling light, refreshed & empowered. Your heart and soul will be filled with light & warmth to support your Growth into Summer. I will teach you: what is detox & why is it essential, what are the main acidifying/toxic foods and why, how to avoid many toxins and demo detox tools. Every morning, Alva, my dearest friend and fabulous yoga teacher, will guide you through pranayama, asanas and relaxation focusing on the release of toxins from your whole being. WuTao Dance is a meditative form of dance based on TCM. I will take you on a beautiful journey to explore the Wood Element through dance. The wood element is associated with Spring as well as the organs, Liver and Gallbladder and emotions of anger and irritation. WuTao Dance is a fun and therapeutic way to dance your emotions and feel rejuvenated. This is one of my favourite forms of therapy. It is very powerful and incredibly detoxifying. I always have Purnima and her Sessions are offered at all my retreats. Purnima is a darling friend, colleague and my personal therapist. She will guide you through this wonderful session. Rebirthing/Breathwork Therapy is a defined breath technique that gently and consciously releases negative memories and stress, creating space for the changes in your life. This work reveals your inner wisdom which then helps you to improve your quality of life. FOOD: Gluten-free and Vegan. All produce will be sourced organically and locally as much as possible. You will be indulged in alkalizing & detoxing ingredients. Expect delicious green juices, alkalizing broths, raw salads and yummy treats. LOCATION: 42 ACRES is set in the heart of Frome, Somerset, nestled amongst rolling hills and seven hundred acres of ancient forest. A truly enchanted place! ACCOMMODATION: The accommodation at 42 Acres is wonderful. A wide range of gorgeous rooms is offered. 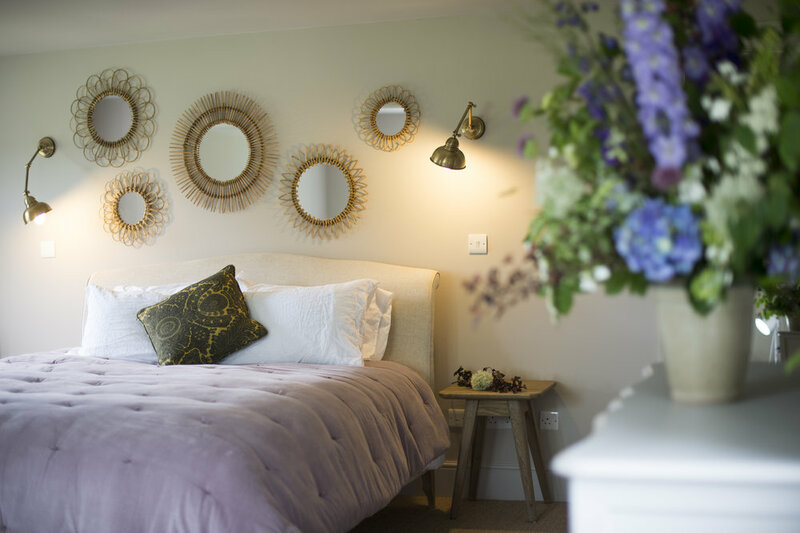 Organic toiletries, luxurious bed linen and towels are provided. The rooms are all stunning and individually designed. If you are driving to the venue, I will send you directions. To secure your place now we need a 50% deposit with the remaining balance due by April 1st, 2018. A two-month cancellation notice is required for full deposit refund. Join me & my team for a 6 days retreat at Chez Zen, in beautiful South of France for a life changing experience to expand your understanding of well-being. Embrace & reconnect with the 5 Elements through Yoga, Pranayama, Meditation, Vegan Cleansing Food, Nature, Ayurveda & Chinese Health Principles, Holistic Therapies, WuTao Dance, Workshops and much much more. Chez Zen is located in the picturesque province of Gascony in the south-west of France, only 1h10min from Toulouse. Gascony is often known as the Tuscany of France, with rolling hills, a plethora of sunflowers, wonderful fortified hilltop villages and a multitude of vineyards. Shower with a 180-degree view of nature. Can be used as a steam bath. (We have 1 room available). Main house: A bit smaller, bright room with high ceiling, on the ground floor, en-suite facilities and a green and illuminated yard. View towards the sundown. To secure your place now we need a 50% deposit with the remaining balance due by September 5th. A month cancellation notice is required for full deposit refund.